What is Connecting Our Future? Connecting Our Future is an initiative to engage regional stakeholders in an effort to collectively identify opportunities to enhance the movement of people and goods across the ten-county Upstate region. The first phase included the development of a Shared Mobility Vision for the Upstate as well as identification of potential regional strategies. The vision was unveiled during a regional event in August 2018. Phase 2 is currently underway and includes refining the strategies and development of a Regional Mobility Coalition. July 2017 – October 2017 Discovery & Understanding: The initial component of this step was a Connecting Our Future Kick Off Event held on October 18, 2017. The program included discussions around the current transportation/mobility landscape in the Upstate as well as challenges, opportunities and future technology and innovation trends. The keynote speaker for the event was Carla Bailo, Assistant Vice President, Mobility Research and Business Development, The Ohio State University. October 2017 – May 2018 Development of Regional Mobility & Connectivity Vision: This step included the hiring of a transportation consultant to help answer the questions of “What do we need? What do we want? How do we get it? and Who needs to be involved?” An Regional Fact Book was created as a result of this initial research phase. In March 2018, the Connecting Our Future Advisory Committee hosted an Idea Exchange at the Michelin Conference Center. This informative and highly interactive workshop featured a series of small group conversations organized around timely topics. Participants learned more about the current state of the region, heard a variety of perspectives on mobility in the Upstate, and joined dynamic discussions to share ideas and collaborate on solutions. May 2018 – August 2018 Rollout & Initial Implementation: Following the completion of the regional vision and the public rollout, the real work begins as stakeholders implement the strategies. This step will lead into the long-term effort that will include both local efforts focused around specific areas and modes of transportation and more regional efforts that focus on connectivity and growing the collective capacity. August 2018 – March 2019 Formulation of Phase II Advisory Committee & Implementation: Phase II is focused reviewing and prioritizing issue areas identified in Phase I. 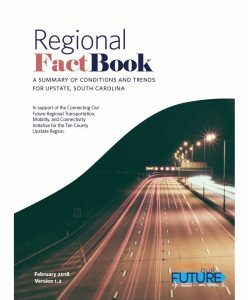 Different strategies and tactics will be identified and reviewed in order to implement projects that have the greatest opportunity for positive impacts in moving people and goods across the Upstate region. The Connecting Our Future effort is led by a coalition of Upstate stakeholders representing education, transit systems, local governments, economic development organizations, healthcare, conservation groups, and Upstate businesses. Financial supporters of Connecting Our Future understand the importance of addressing the Upstate’s transportation, mobility, and connectivity challenges. Comprised of businesses, local governments, community organizations and individuals interested in making a positive and measurable impact on current and future mobility and connectivity in the Upstate, the Upstate Mobility Coalition (the “Coalition”) will support and provide a platform for successful implementation of the Connecting Our Future Mobility Vision & actionable strategies through a Leadership Team and Task Forces.